Photo: Paul Rudderow. Video: Daniel Gajdamowicz. 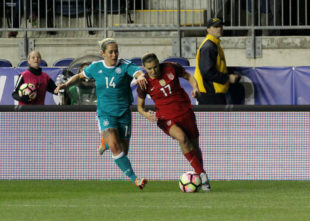 The U.S. and Germany played a mostly even match in their opener in the SheBelieves Cup before a reported crowd of 16,318 at Talen Energy Stadium, until the breakthrough came in a barrage on Germany’s goal. Christen Press slammed a shot off the crossbar and Tobin Heath fired the rebound, only to have the shot blocked. However, Williams found herself in exactly the right spot, and she buried her opportunity to score the game’s only goal, the second of her international career. After that, the U.S. controlled much of the match, coming up short on several attacks but nonetheless sealing the deal on the shutout. The U.S. played a 3-4-1-2 throughout the match, with defenders Becky Sauerbrunn, Allie Long and Casey Short starting their fifth straight match together. Germany’s best chance came in the 12th minute, when Sara Däbritz pounded a shot that looked destined for the upper right 90, but U.S. goalkeeper Alyssa Naeher made a diving save to clear the threat. The match was the second of the day at Talen Energy Stadium, following France’s 2-1 victory over England on Wednesday afternoon. In that match, England took a 1-0 lead late into the game, only to see France’s Marie-Laure Delie equalize with an 80th header, followed by Wendie Renard’s winner in the fifth minute of stoppage time. The U.S. will next play England at Red Bull Arena in Harrison, N.J. on Saturday at 5 p.m. Editors note: For additional post-game video of interviews with USWNT players and head coach Jill Ellis, click here. Pepperdine proud!!! Great job, Lynn! Cleaning up the trash in front of the goal, reminded me of so many of Jack Mac’s goals here. Well done.